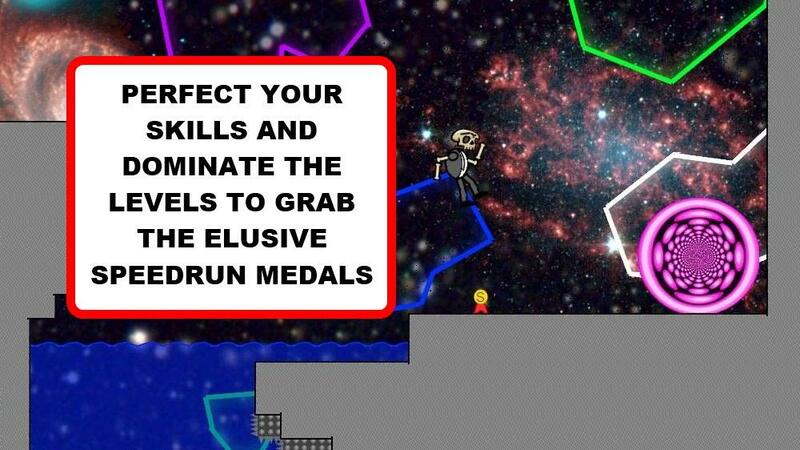 BoneD: Dead Men Don't Jump is a cutesy platformer on the Indie channel of X-Box Live. Despite it's childish look there is some skill required however minor that may be. 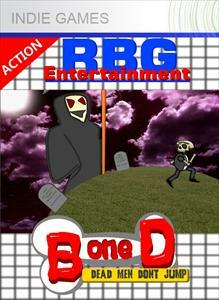 The game casts you as a suit wearing skeleton (BoneD, the D standing for Daddy?) You enter a series of vortex's, each one taking you to a different level in which a gigantic screen filling Grim Reaper chases you through a platform littered environment. The levels are accessed from a main hub area. It is kinda confusing as some portals take you to levels while other identical looking portals just take you to different sections of the 2D hub world. The levels seem quite random, having unrelated backgrounds. One had a mist effect going on, while another level had images from the classic videogame Asteroids. 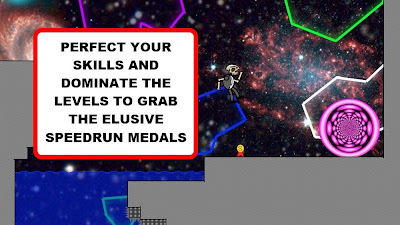 BoneD can jump off walls to get to higher platforms, he can submerge himself in water before he is pushed back up to the surface. Enemies appear every now and again, ghosts seemed to be the main enemy type, defeat them by bouncing off their heads. The levels are full of instant death spikes, when you die your body vanishes just leaving your skull to bounce off the screen. It is ok, competent just not particularly exciting. The music is quite good, a Latino sounding acoustic guitar track plays over most the levels. At 240 Microsoft points it is a bit expensive for it is quite a simple basic game of which there are a load of just as good cheaper alternatives.